XML and JSON are the two commonly used data formats for serializing data over the wire. Many a times you need to map XML or JSON markup to C# classes. Suppose you are developing an application that consumes some Web API or WCF service. Further assume that the service returns data as XML or JSON. When this data is received in your application you would want to read the data and store in C# object(s). Thus you need C# classes that match the structure of the XML or JSON data. No doubt, you can create these C# classes manually but Visual Studio can provided a good starting point by automating the process. 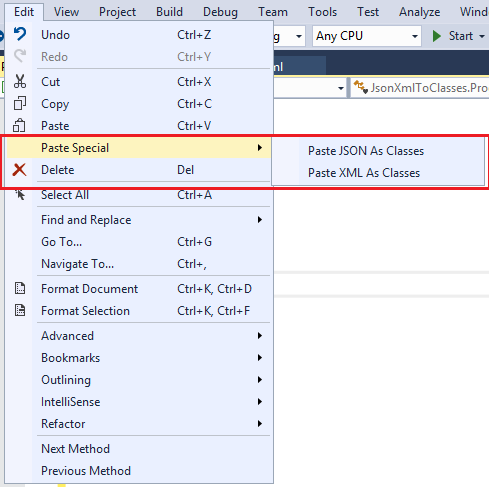 As you can see, the Edit menu contains Paste Special sub-menu with two options - Paste JSON As Classes and Paste XML As Classes. These two menu options do the respective class creation for you. Let's see how these options work with a few examples. Create a new Console Application project in Visuals Studio and add an XML file and a JSON file to it using Add New Item dialog. These files are merely used to generate the sample XML and JSON markup. You can also create the markup in some external editor such as Notepad. Then copy the above markup using Ctrl + C and then switch to the Program.cs file. As you can see, the class generated from the XML markup is bit verbose and has XML serialization related attributes. Now the Rootobject clas contains an array of Employee objects. The Employee class defines the four public properties as before. Let's repeat this with XML data. This time two classes get created - Rootobject and Phones. The Rootobject is as before whereas the Phones class contains the home and work properties. The generated C# code may not be precisely as per your expectations. But you can always adjust and fine tune the class names and property names as per your application's need. Visual Studio does provide a good starting point helping you to save good amount of work.